CIE's distance education Broadcast Engineering course was designed to provide the specialized knowledge required for a career as a broadcast engineering technician at an AM radio station, FM radio station or at a TV station. This course has been updated to include new learning modules on Audio Basics and Advanced Audio and Media along with an interactive Audio/Video Companion CD. Learn about electronics along with emerging mobile media technologies and get started on a new career path! Students will have a firm understanding of the electronics technology found in Broadcast Engineering along with the increasing presence mobile media and digital audio have in today's marketplace. The technology of Audio Production including microphones, loudspeakers, mixers, consoles, and control surfaces will be covered through theory and conceptual discussions. Students will be exposed to various audio and video processes including recording, editing and mixing techniques in the companion CD. This course is designed to explore the principles of AC circuits by identifiying components, rectifiers and basic amplifiers. Students will understand digital circuits and relays that are used in AND, OR and NOT circuits. The mathematics of square roots, phasors, graphical solutions and scientific notation is also presented. Explore semiconductors in practical circuits with emphasis on power supplies. 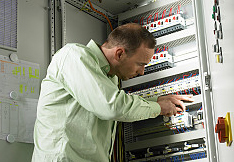 Learn how to use electronic test equipment to troubleshooting electronics circuits. Radio-Frequency amplifiers are covered along with operation of solid state devices such as diodes and transistors. Learn about operational amplifiers and other analog circuits commonly found in the field of Broadcast Engineering. Students gain a strong foundation in the principles, technology and techniques of audio production. Because the material is not medium-specific, students can apply these techniques to sound production in any of the major audio and audio/visual media. Students learn the techniques and principles necessary for audio production including mobile media, game sound, smartphone, tablet, apps and digital audio. Learn the informational, perceptual, and aesthetic aspects of sound as they apply to each stage of the production process, from planning to postproduction. Postproduction topics include a discussion in editing and mixing for television, film, music and mobile media. Includes various animations to better display audio concepts such as compression/rarefaction, audio file examples of binaural recording and audio effects such as echo, reverb, etc. Videos show the use of sound dubbing used in special effects for video. 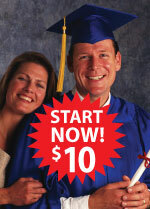 Enroll on-line in Course 2 for only $10 down. 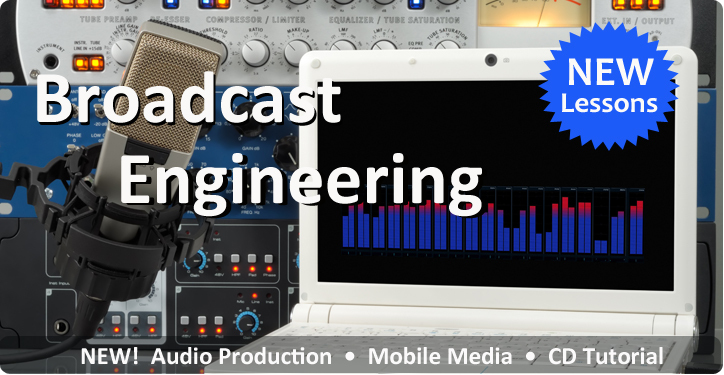 How Does The Broadcast Engineering Program Work? This program contains 95 lessons that you can complete at home. When you finish a lesson you can take your exam on-line on CIE's e-grade Web site anytime you want - day or night! Your test will be processed and your score emailed back to you. The program was created specifically for the distance education student. Experience a step-by-step method of learning that allows you to complete each lesson at your own pace when it's convenient for you. Instructor support is included with tuition. Our instructors work directly with you one-on-one to answer your questions and provide you with technical assistance when needed! Distance Education or Distance Learning is when the instructor and the student are in separate locations. This curriculum is specifically designed to educate students who live at a distance from a college. Questions about course material can be answered though CIE's qualified instructors via e-mail, chat room, telephone or mail. Distance education is quickly becoming the new way to earn a diploma. Course 2 graduates may continue their education with CIE and receive full academic and tuition credit that can be applied towards CIE's more advanced programs like courses 11 and 14B. A study guide on how to prepare for the Associate-Level Certified Electronics Technician (CET) exam is also included. This test is administered by the International Society of Certified Electronics Technicians and has over 46,000 certified technicians across the globe! Graduates are eligible to earn a Certified Broadcast Technologist certification (CBT) from the Society of Broadcast Engineers (SBE). SBE is the only organization devoted to the advancement of all levels and types of broadcast engineering. Some of the benefits of joining SBE are listed below. Certification enhances your value to your employer, or if you are self-employed, preparing you to meet the changing needs of your clients. To help keep broadcast engineers up-to-date on emerging technologies and important industry issues, SBE sponsors Ennes Workshops and educational programs at your local SBE chapter. Whether you’re looking to find or fill a position as a broadcast engineer, SBE JobsOnline and the SBE ResumeBank should be the first place you go. Life, health, business and professional liability insurance programs are available to members at competitive rates. In addition, a free sample contract is available for contract engineers along with discounts on books, car rentals and industry event registrations. With more than 5,000 members and more than 100 local chapters, SBE provides a forum for the exchange of ideas and the sharing of information to help you keep pace with our rapidly changing industry. Separate yourself from the rest of the pack! A CIE diploma combined with these two professional certifications enable employers to separate knowledgeable job applicants from those with less training and skills. Another big advantage of enrolling in CIE is that you can study at your own pace and CIE's open enrollment policy means you can start this program at anytime. Some students go through the program slowly, others at an accelerated level so we can accommodate almost any arrangement that suits you best. With our generous time allotment of 24 months for Course 2 you can be assured to have enough time to complete your program. This program explores important theories and principles related specifically to broadcasting, but because it does not contain any laboratory work, it is best suited to those students who already have some previous education or practical experience in electronics. End of lessons required for a diploma.